Facing the splendid Ionian Sea and plunged in a lemon garden, the holiday home of “Residence Maia Volcani” is the ideal location for your holiday of relaxation by the sea. 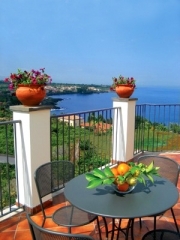 Situated in the fishing village of Santa Tecla, it’s just 5 km far from Acireale and 15 km from Catania. STROMBOLI: Studio flat, first floor, living room with kitchen, king size bed, cupboard, Tv Sat, air conditioning, table with 4 chairs. Bathroom with shower. Sea view, terrace with 1 table, 2 chairs, 1 beach umbrella and 2 cots. MOJO: Studio flat, first floor, living room with kitchen, king size bed, cupboard, Tv Sat, air conditioning, table with 4 chairs. Bathroom with shower. Sea view, terrace with 1 table, 2 chairs, 1 beach umbrella and 2 cots. EMPEDOCLE: Apartment with three rooms, first floor: a living room with kitchen, table with 4 chairs,.Two bedrooms with king size bed, cupboard, Tv Sat, air conditioning. Bathroom with shower. Sea view, terrace with 1 table, 2 chairs, 1 beach umbrella and 2 cots. MONGIBELLO: Apartment with three rooms, second floor: A living room with kitchen, table with 4 chairs, single bed sofa. Two bedrooms, 1 with king size bed and 1 with double bed ; cupboard, Tv Sat, air conditioning. Bathroom with shower. Sea view, terrace with 1 table, 2 chairs, 1 beach umbrella and 2 cots. ETNA: Apartment with three rooms, second floor: A living room with kitchen, table with 6 chairs. One bedroom with king size bed plus 1 single bed; cupboard, air conditioning. One living room with bed sofa (king size), Tv Sat, air conditioning. Bathroom with shower. Sea view, terrace with 1 table, 4 chairs, 1 beach umbrella and 2 cots. All apartments have a terrace and are all equipped with mini kitchen, air conditioning, satellite TV. Private parking available inside the residence.